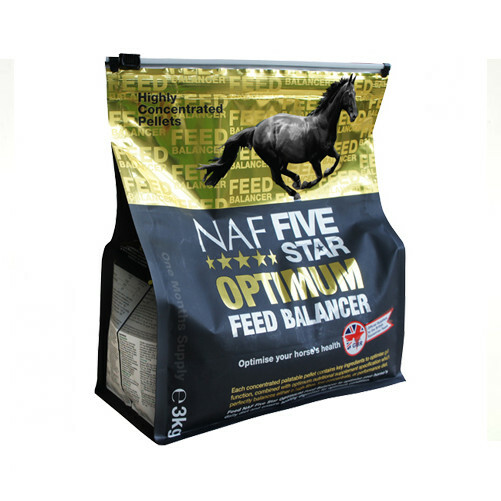 NAF Five Star Optimum Feed Balancer helps to maintain top health, maximise the nutritional value of the daily feed and optimise the efficiency of the digestive system. This highly palatable supplement comes in pellet form and has an excellent sugar free flavour that horses enjoy. Formulated mainly to partner a high fibre low concentrate or performance diet, it can also be fed alone, direct from the hand. An excellent choice to optimise every horse's diet, from family pony to performance athlete. Grass meal, Calcium carbonate, Wheat feed, Dicalcium phosphate, Linseed oil, Maize, Brewers' yeast, Mint, Ginger, Dandelion leaves, Whey protein powder, Oligofructose (dried), Saccharomyces cerevisiae extract, Sodium chloride, Glutamine, Vegetable oil, Elecampane, Licorice, Whey powder, Magnesium oxide. Amino acids dl-Methionine (3.1.1) 1010 mg, l-Lysine monohydrochloride (3.2.3) 2020 mg. Trace elements Calcium iodate, anhydrous (E 2, 4.03 mg Iodine) 6.24 mg, Cupric sulphate, pentahydrate (E 4, 181 mg Copper) 725 mg, Ferrous sulphate, monohydrate (E 1, 604 mg Iron) 2020 mg, Manganous oxide (E 5, 403 mg Manganese) 650 mg, Selenised yeast inactivated (3b8.10, 1.61 mg Selenium) 1610 mg, Zinc oxide (E 6, 806 mg Zinc) 1120 mg.
Vitamins Biotin 6.44 mg, Choline chloride 403 mg, Folic acid 30.2 mg, Nicotinic acid 178 mg, Pantothenic Acid 100 mg, Vitamin A (E 672) 60500 I.U., Vitamin B1 100 mg, Vitamin B12 671 ?g, Vitamin B2 67.3 mg, Vitamin B6 40.3 mg, Vitamin D3 (E 671) 10100 I.U., Vitamin E (3a700) 1710 I.U., Vitamin K 34.2 mg.
Binder Bentonite-montmorillonite (E 558) 216000 mg.
Digestibility enhancer Saccharomyces cerevisiae NCYC Sc47 (4b1702) 9.6 x 1010 cfu. Add to daily feed ration. Do not exceed recommended levels. One 130ml scoop provides approximately 100g. 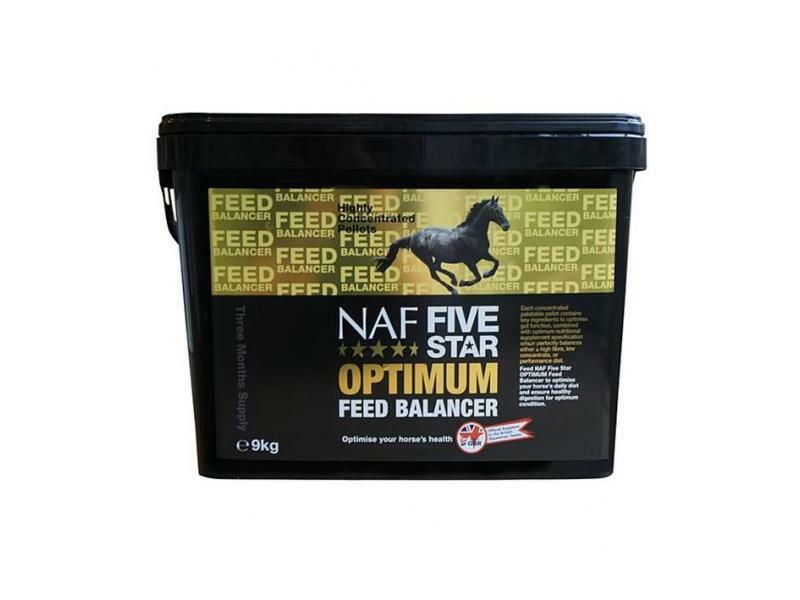 Below are some recent questions we've received regarding NAF Five Star Optimum Feed Balancer for Horses, including answers from our team. The "naf feed ballancer" be suitable and help her? Yes this product should be suitable, but do not give it in large amounts and make sure that the only other food she gets is grass (including hay or haylage). A high fibre diet with very limited foods of other types is important.